This books describes the Devices App which can be used to manage all devices that belong to a single installation. Devices mission is to manage all the devices that belong to a single installation. When it starts, it shows a list of domains on the left side (because the Domains tab is active initially). After having run the Install, there is only one domain in there , which is the one you defined during the Install. In many projects, there will be no more domains. But in some projects, where you serve multiple customers with a single system (a.k.a. multi-tenant, for example when a hoster runs individual PBXs for many customers), more domains will appear here. During this course, we will not cover such scenarios. In the Devices tab, there is a list of devices known in this installation. You could limit this list to the devices which belong to a certain domain by selecting one or more particular domains in the Domains tab. Of course, in this course, it doesn't make a difference as we only have one domain. But isn't there a domain called Unassigned devices? 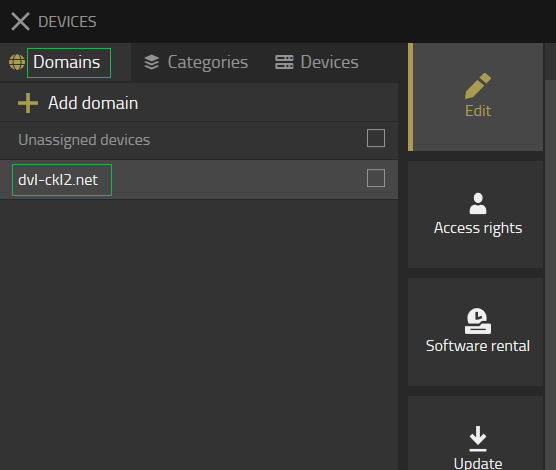 This of course is a pseudo domain which selects all devices that are connected to Devices but not in its device database. This for example may happen if a device was previously part of the installation but had been removed. 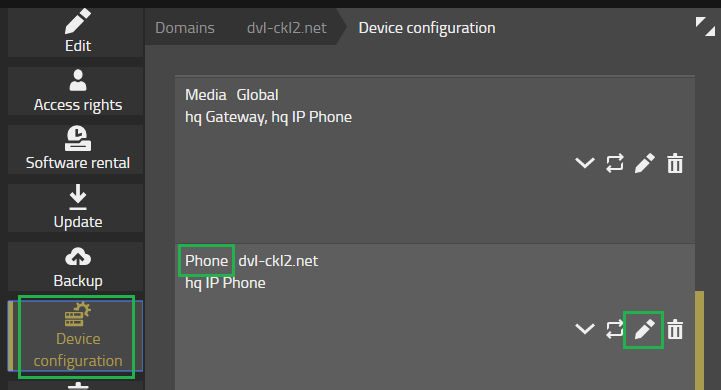 If the device still connects to the Devices App, it is listed here. Both the AP and the PBX are located on the IP411LEFT which you have set up using the Install. One is the PBX itself, the other the application platform running the apps (AP). As they run on different CPUs (well actually different CPU cores) and run different software, they are treated as separate devices in Devices. When you are in the Devices tab and a particular device is selected, a number of functions on that device are available in the right pane. This tab gives you access to the individual device admin user interface. Before v13r1, this user interface was the only method to configure the whole system. From v13r1, you still have full access to it and you can do all device configurations as you like on it. However, in many cases, you won't need it any more as you have the Apps doing the work for you. Especially if you need to do some configuration on multiple devices to implement a specific function, the Apps can do it for you on a single place which greatly simplifies your life as an administrator. Let us look at the last point in some more detail. The technology used to provide you with the device's user interface is known as WebSocket. 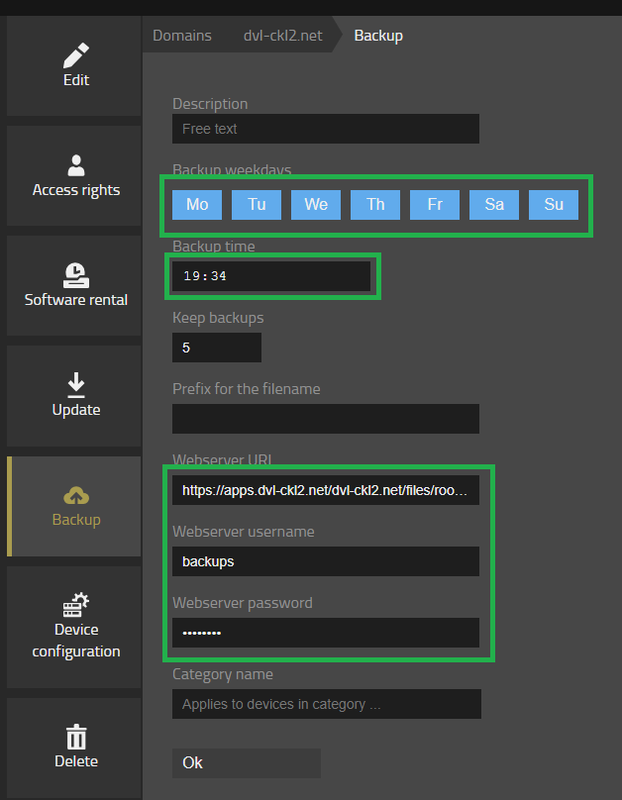 The devices you add to your installation will always try to establish a WebSocket connections to the Devices App on your App Platform. When the connection is up, Devices will tunnel all your usage of the user interface through this connection. 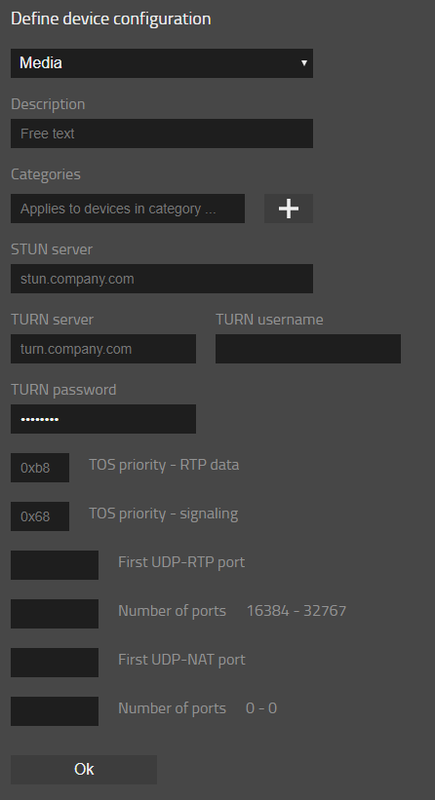 This way, you can access devices even though they are located behind a remote NAT router. 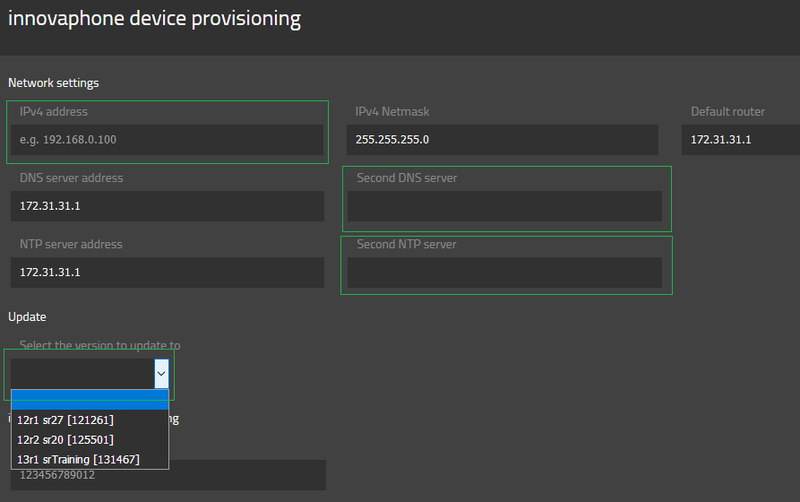 No special configuration on the remote NAT router is required (for example, no port forwardings). 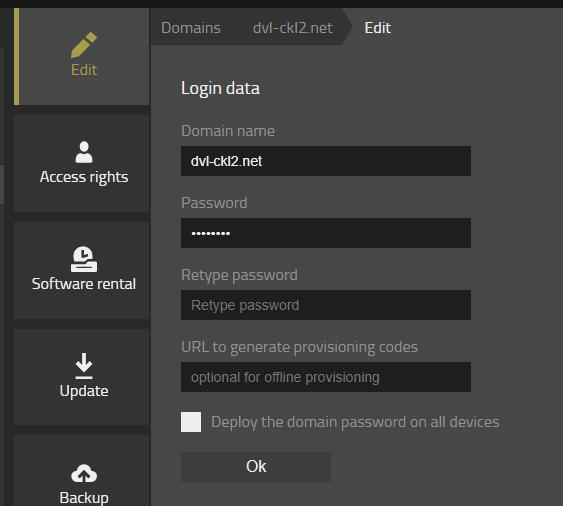 This is a great tool if you have to maintain devices in remote sites, like when you have home offices or when you run a hosted PBX service and you need to access remote phones for example. You can assign categories to devices. If you like, categories are just names for groups of devices. Therefore, one application of such categories is to filter the device list. Don't forget to uncheck the category again after trying this, so you see all devices again! You can add multiple categories for a device. 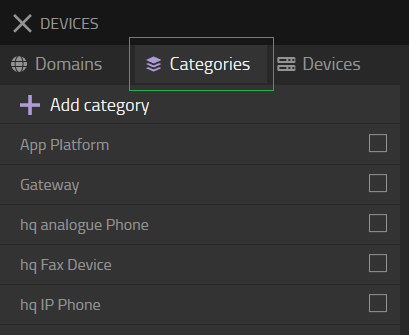 Before you can assign a category to a device, you must define the category. This is done in the Categories tab. Some useful categories are already created by the Install but you can add more . Normally, categories are used for filtering in the list of devices. 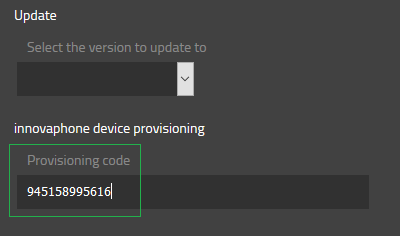 However, if you tick the Provisioning category check-mark , the category will also be available to select devices for provisioning of specific device configurations. We will come back to this later. 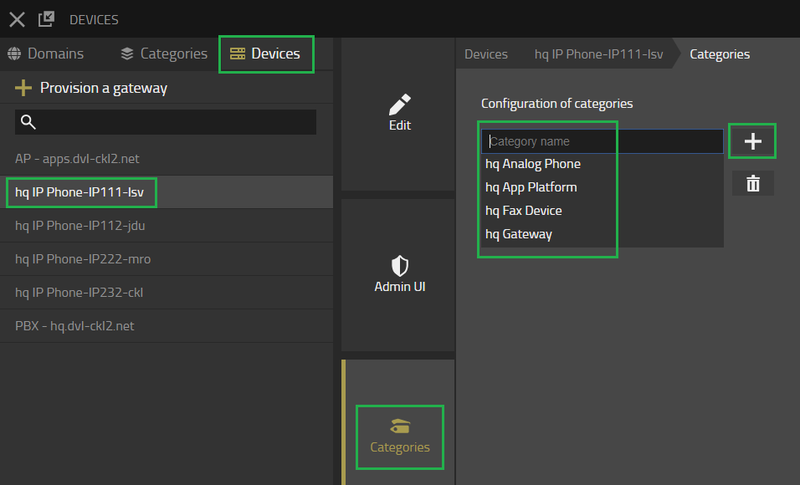 Note that while you can assign multiple categories to a device, you can only assign a single category with the Provisioning category check-mark to a device. If you have physically removed a device from your installation, Devices will show it as missing . In this case, you can also remove it from the Devices database. Be sure though that the device is obsolete really. In many cases, when the device does not connect to Devices, there is some network issue that keeps the device from connecting. In a clean installation, no devices should be marked disconnected. 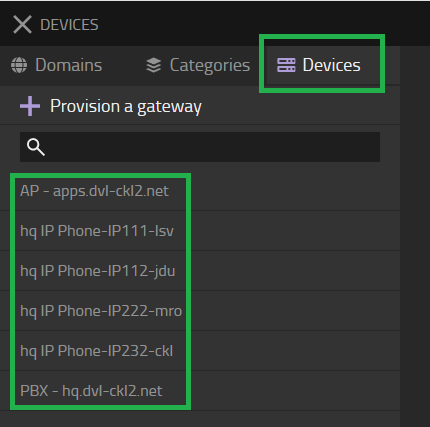 When we look at the list of devices present in the system, we see some which were added by the Install (the PBX and AP) and some that were added by the admin (the phones when they were provisioned). 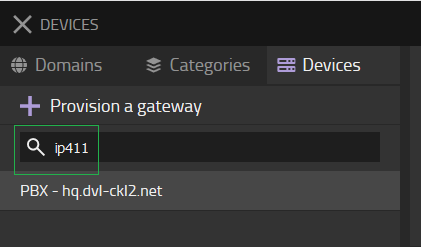 Let us see now how extra gateway devices are added to the system. As opposed to the phones however, you first need to access the devices web user interface, as it does not have keys or something similar that would allow you to type in the code. In a real-life scenario, you would just type in the device's IP address of course. The web page you will see is the same as when you ran the Install for the PBX. However, as you do not want to create a new system, you select the Add the device to an installation mode . Devices will create the provisioning code and we can cut & paste it to the Install that runs on our IP811. The device will then reboot with the update network settings (well, potentially updated network settings, as discussed, we don't have to change anything here in the training). When we click on Next then, the Install will show Waiting for provisioning for a short while and then we are done ! When we switch back to Devices, we see that our IP811 has been added to the list of devices. When you are in the Domains tab and a particular domain is selected , a number of functions on that device are available in the right pane. The Edit tab seems to have a pretty obvious function: you can rename the domain and set its password. However, it will probably be a rare occasion that you change the name of the domain. 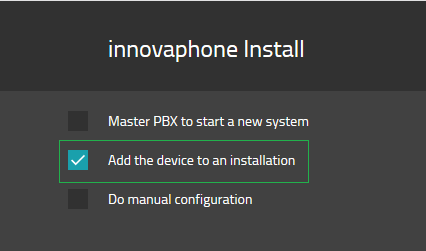 The Install has asked you for the PBX's Domain name during initial setup. This name (invalid member reference '.domain' in 'domain' in your case) was then used in a lot of places and the domain name here in the Devices app is one of them. If you rename it here, it will in fact only rename it here. You can do this and it won't do any harm, but it might be confusing to you later on - as the name now differs from the various other places where the initial domain name was used. You can also change the password for the domain. This password is interesting if you run a multi-tennant system (e.g. a hosted PBX solution). As we mentioned before, you would create a separate domain for each of your customers. The domain password would then be used by your customer to log in to your Devices so that he has access to his own domain only. However, in a single customer installation (and also in this training), you wont need it. In a previous topic (Managing Users), we used so-called provisioning codes to provision devices. 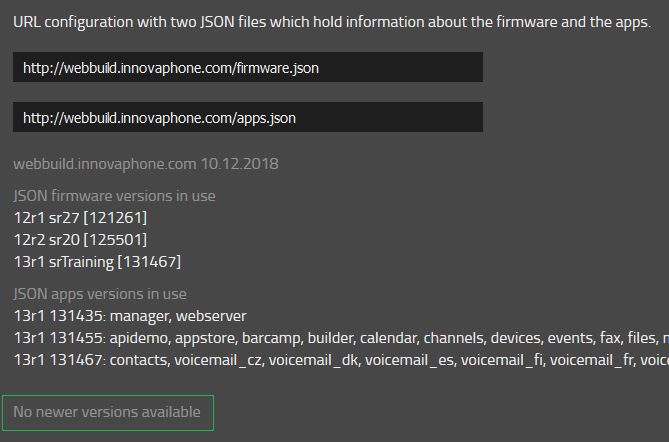 Such codes are provided by a service which is run by innovaphone (http://config.innovaphone.com) and is thus not available if your installation has no internet access. It is possible to run your own instance of this service. In this case, you would configure the URL to your instance in the URL to generate provisioning codes field. However, we will not cover this option in this course, so you should never configure it during the training. Apart from being used as described above, the domain password is also used as the administrator password for the individual device user interfaces (that is, when you access the device directly with the browser, we will talk about this later in more detail). When the Deploy the domain password on all devices check-mark is set, Devices will change this password. In real-life, this is a very good idea indeed (as a device with a non-secure device password is a security breach). In this tab, you can specify a list of domains that should also have access to the current domain. This is of course again useful in a multi-tennant system only. This way, you can specify a domain whoose administrator also can manage some other domains. This might happen in a hosted-PBX scenario where a reseller manages some but not all of the PBXs in the hosting system. In this training, we will not use it. This tab allow you to update the firmware and apps on your system. To run firmware and software updates you first need to define which version shall be used. This is done in the Update settings dialogue . When there are updated version in your AppStore, the dialogue might look a bit scary first, but its not that difficult. You can tick the Apply available versions check-mark and click on Apply then. In the course however, there are no newer versions available . So far, no firmware or Apps update happened. To apply the versions you selected in the previous step, you need to create an update job . All devices which are currently connected to Devices (and match the criteria) will be updated at the selected date and time. When a device connects to Devices later on (for example because it has been added to the installation or it is simply turned on), the firmware it runs will be checked an an update will be initiated if it does not match. In fact, Devices does not do the update itself. Instead, it tells the device to do so. Therefore, the device must have access to the server that has been set for the URLs in the Update settings before. Also, not all the devices will receive this request at the same time. Devices will initiate an update on 20 devices at the same time. Further devices will receive it once another device has completed the update. Devices can also update the boot code at the same time when the Update bootcode check-mark is ticked. Also, Devices can upgrade devices to the latest major version by ticking the Major firmware upgrade check-mark. To update to a newer firmware and Apps version as before, you can simply create a new update job. When there are multiple update jobs defined for a particular device category, Devices will only apply the newest one. This allows you to keep the history of older update jobs. 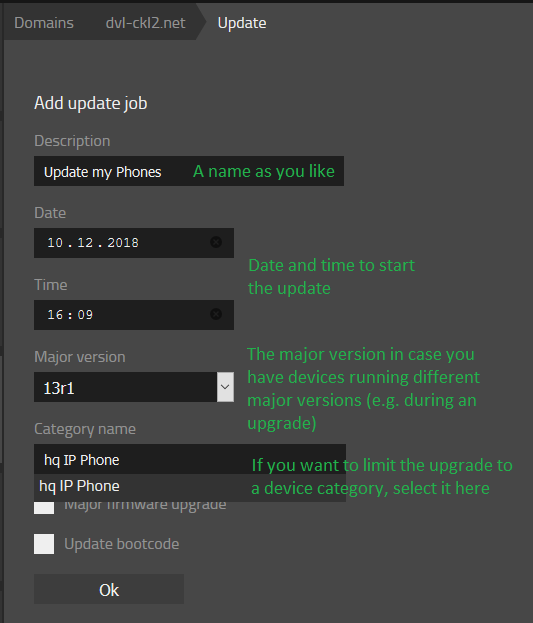 Keep in mind that before you create the new job, you must update your Update settings as described above (otherwise, the new job will behave like the old one). 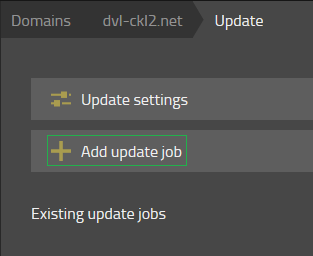 To create a new job with the same settings as an existing one (except for the versions used), you can clone the current one by clicking on the little + sign . However, if you always create new update jobs, over time many obsolete jobs will populate your Update view and this may become confusing. For this reason, when you are cloning a job, the option Delete old update job is available and checked by default. Of course, you can also delete the old ones eventually. Finally, you can also simply edit an existing job. However, the edited job will retain its existing history and the firmware to be deployed will not be changed (even if you have changed your Update settings before). Therefore, to deploy new firmware, you must create a new job (or clone an old one). 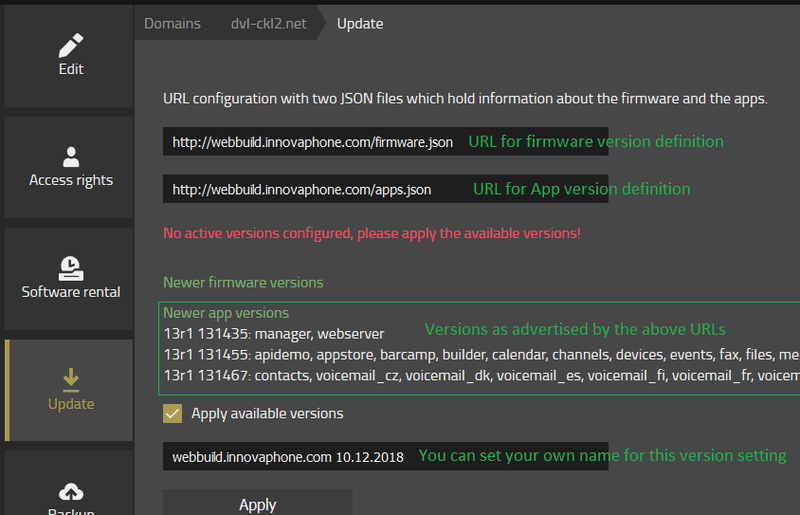 As discussed before, the version definitions are fetched from a site hosted by innovaphone, store.innovaphone.com. This of course means that you can not control their contents. As shown, you can select when to upgrade to the latest-greatest version. But you can not select which one this shall be. In other words, if you want to provide your own definitions, you also have to provide the binaries. 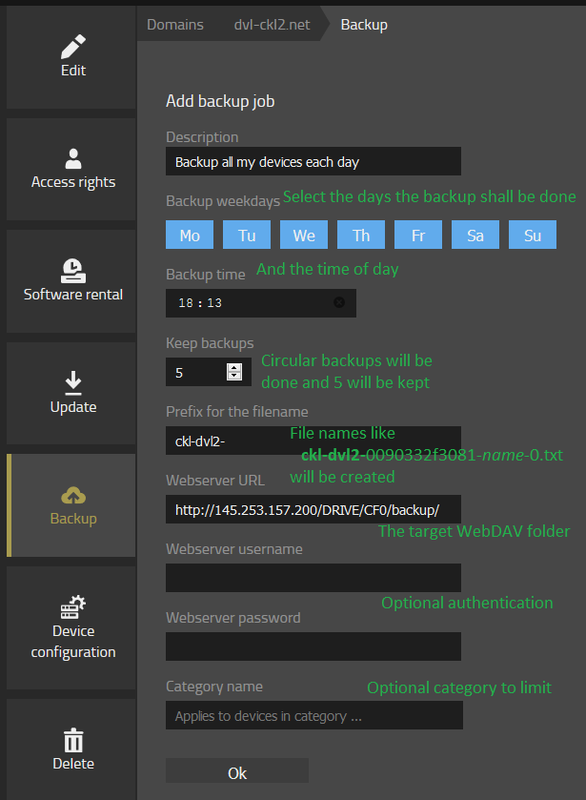 Devices can do regular backups for all of your devices. This is done in the Backup tab . It is recommended to save the backups to a WebDAV server that is not part of the PBX system itself. However, if such a web server is not available, the Files App on the application platform can be used. 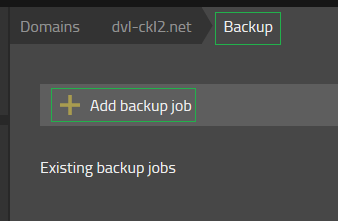 For each backup job you created, you will see its state , when you click on the little caret (^) on the right of its entry in the list of backups. You might have observed that the User and Password fields are marked as optional. 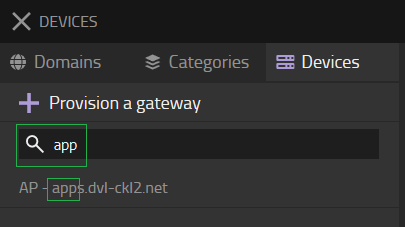 If you leave both empty, the files will not be available via HTTP/WebDAV easily. 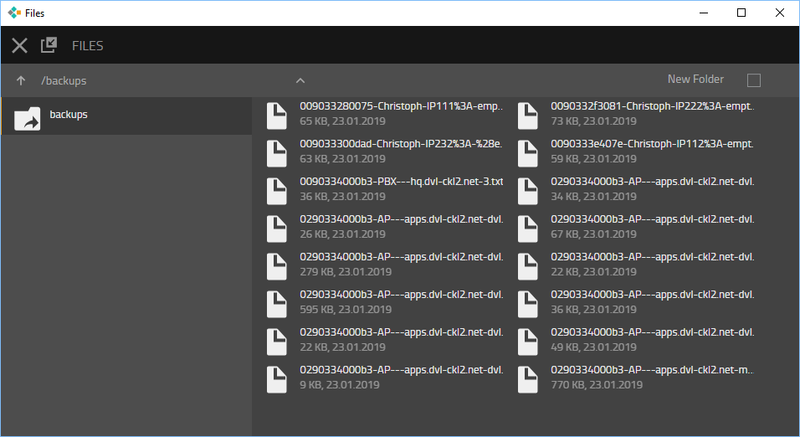 Instead, they are available to other Apps (for example the Waiting Queue where Files is used to store media files - we'll get back to this later). You can close the Files App now. 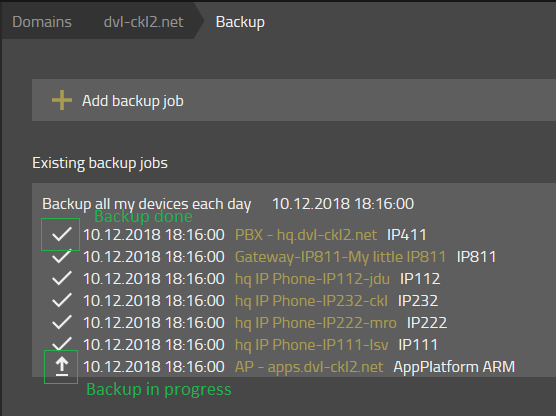 When the time has come, you will see a number of backups appearing in the backup folder in the Files App. Restoring a system is not that trivial. If you run in to a situation where you need to do a partial or complete restore, contact presales@innovaphone.com for advice. You can of course delete a domain. However, this will also delete all domain related information (such as categories and devices), so it is rarely a good idea to delete a domain. Devices can deploy configurations to all the devices which belong to an installation. Various aspects of device configuration can be controlled and different settings can be deployed based on device categories. 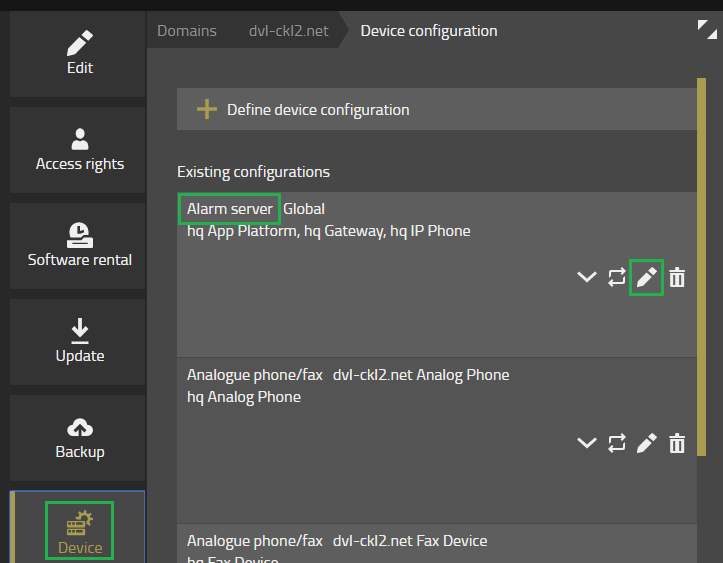 To create a device configuration, you select the domain and the Device configuration tab and click on the + Define device configuration button . You then can select the type of configuration you want to add. Some types have optional properties. They are deployed only when checked . Otherwise, possibly existing current settings for these properties on the device are not modified. innovaphone devices can send messages reflecting possible issues (so-called events and alarms) to a central service. The administrator then has the possibility to browse through the messages generated by all these devices in a single place. In addition to that, log messages reflecting normal operation can be sent to a central service which helps administrators to understand what is going on. 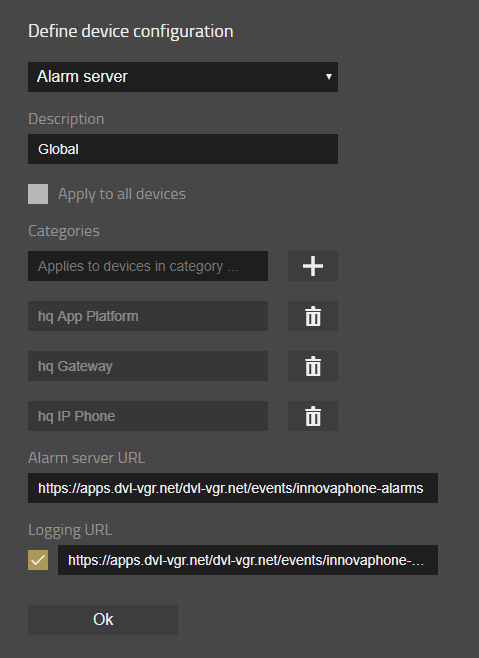 The Alarm server type of device configuration lets you configure the URLs of those two services . The URL for the log messages server is optional. Install has created a useful device configuration of this type. So let us look at what it has created . it also added categories hq App Platform, hq Gateway and hq IP phone. 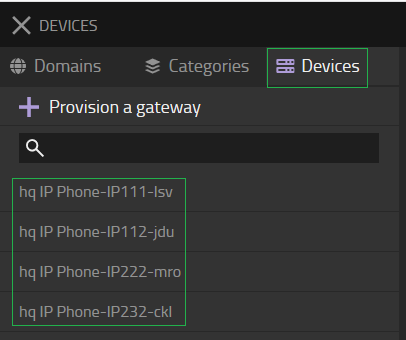 These categories cover all possible devices, as any device is either an App Platform (IP411LEFT), a gateway (IP411LEFT, IP811) or an IP phone (IP111, IP112, IP222, IP232). 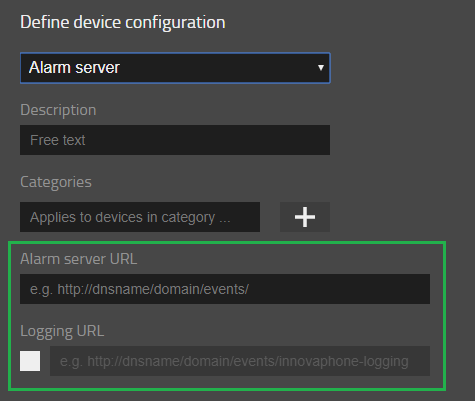 the Alarm server URL is configured and points to https://apps.invalid member reference '.domain' in 'domain'/invalid member reference '.domain' in 'domain'/events/innovaphone-alarms. innovaphone devices which can terminate voice (a.k.a. media) have a number of settings which influence the way media-data is sent or received. The Media type of device configuration lets you configure these settings. 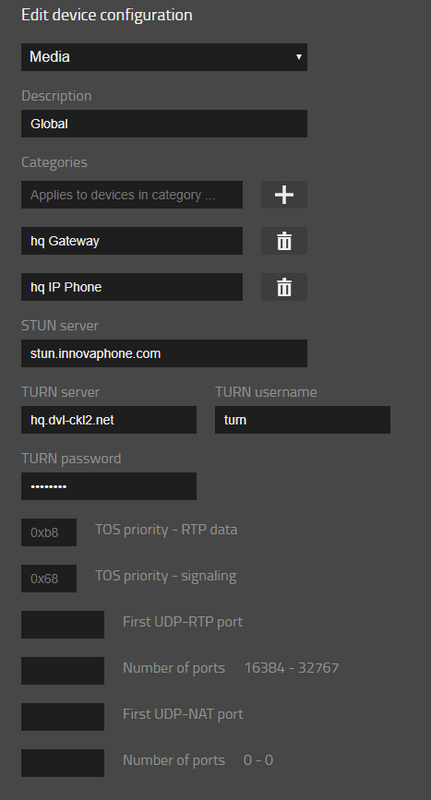 the STUN server is set to stun.innovaphone.com. in contrast, the TURN server is set to hq.invalid member reference '.domain' in 'domain'. As you will recall, this points to your own PBX. The thing you need to understand here is that a TURN server is consuming a substantial amount of both CPU and network traffic resources. It is therefore not an option to use a service operated by innovaphone. Instead, it would be best to use a TURN server that is provided by the customer's SIP-provider or by the customer itself. However, such services rarely exist nowadays. Therefore, the Install has enabled your own TURN server on your PBX and has set the TURN server to this PBX. the remaining fields are left empty so that the firmware defaults are used. These should work well in most installations. VoIP phones (such as your IP111/112/222/232) need a number of settings to be able to register with your PBX. 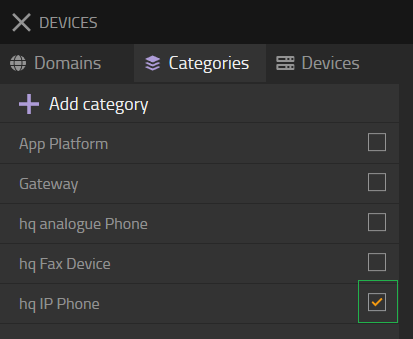 The Phone type of device configuration lets you configure these settings. the settings needed to register with a PBX obviously depend on the PBX to register with. For different domains, you will have different PBXs. For this reason, Install has set the Description to invalid member reference '.domain' in 'domain' (indicating that this configuration applies to all devices). the Primary gatekeeper is set to the value you noted in your setup.xls as DNS name of this PBX: hq.invalid member reference '.domain' in 'domain'. the Dial tone is the tone users hear when they go off-hook on a phone before they dial the digits and is country specific. Users expect a different dial tone in a PBX compared to the public networks. In most countries, EUROPE-PBX is a good choice for this. For some countries however, there are country specific options (such as for example ITALY-PBX and ITALY-PUBLIC). The Install sets that to EUROPE-PBX but there are situations where you need to change this to accommodate user expectations. the Preferred coder defines the voice compression method (a.k.a. as codec) which should be used in your installation whenever possible. You don't need to know much about about codecs, simply keep in mind that OPUS-WB is best. This is why the Install has configured it this way. VoIP systems usually work with full encryption of voice streams and other data. TLS is one of the protocols used for this. 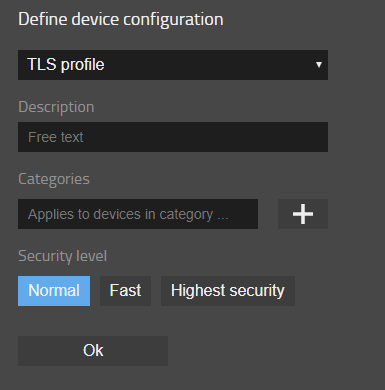 The TLS profile type of device configuration lets you configure these settings. The short answer is: you don't! In some more detail: modifying the TLS profile is rarely a good idea. There is a huge number of settings for TLS and modifying is for experts only. innovaphone has therefore created 3 profiles which implement different Security levels: Normal, Fast and Highest Security. Of course, higher security seems to be a good thing. However, as often in life, better things are not for free. In this case, when selecting highest security, you will impose much higher CPU load on all the devices. Especially on a PBX or on a media-gateway, this will significantly reduce performance so that you can only accommodate much less users with a certain type of device. On the other side, when you run your system with with a lot of users (and perhaps already out of spec as far as user numbers are concerned), you may benefit from the fact that fast security settings result in a notable reduction of CPU usage. For sure though, fast in this case also means less secure. We recommend to use normal settings always unless you really know what you do (see IP4/General/TLS for some more detail). This is also the default and therefore, the Install has not configured a device configuration of type TLS profile at all. In any case, if you intend to work with a non-standard profile, you should use those on all devices uniformly. 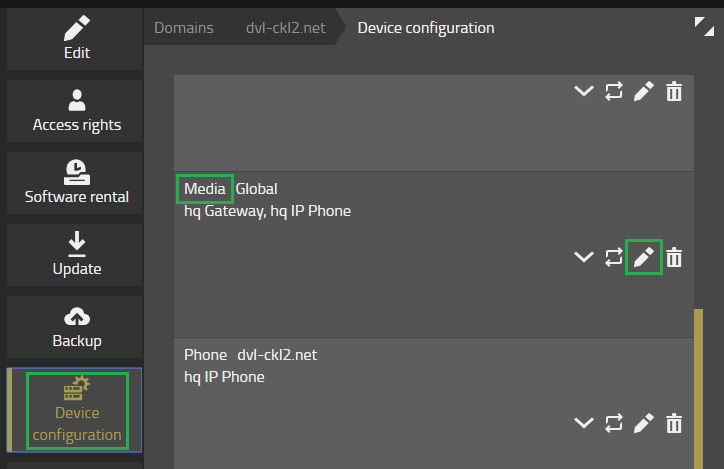 To make sure this happens, you must add categories so that all devices are covered (you can have a look at the Media device configuration created by the Install to see how that works). Analogue phones do not register themselves with the PBX. Instead, the FXS interfaces used to attach the phone do so. So they need a number of settings to be able to register with your PBX, very similar to the Phone settings we discussed before. 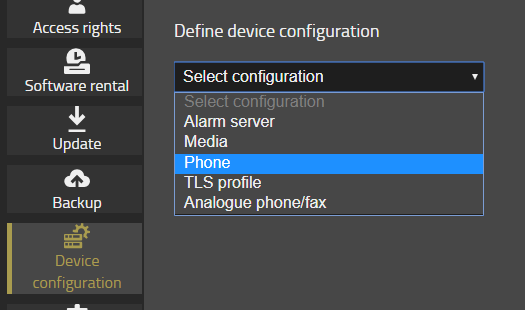 So the Analogue phone/fax type of device configuration lets you configure these settings. Watch out! 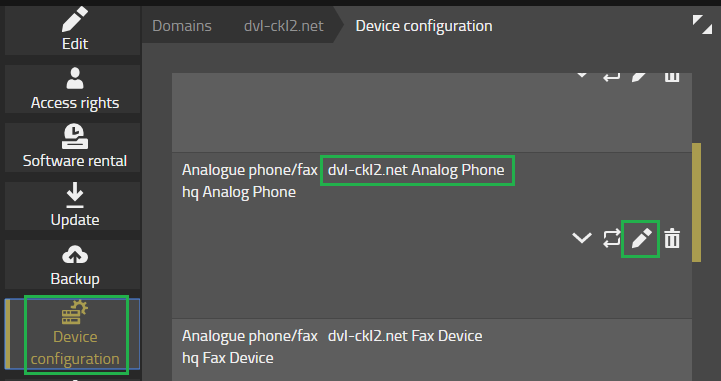 Install has created two configuration settings of this type: invalid member reference '.domain' in 'domain' Analog Phone and invalid member reference '.domain' in 'domain' Fax Device. Make sure you open the first one.